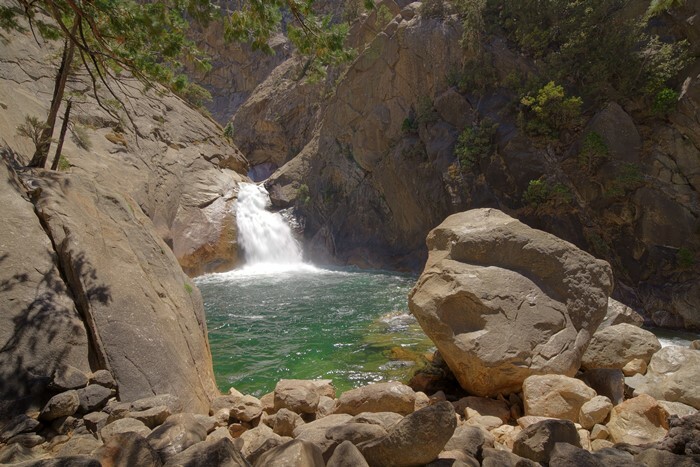 The scenic drive into Kings Canyon takes you deep into the Sierra Nevada Mountains for a look at a dramatic canyon carved through granite. It’s a delightfully curvy road to Cedar Grove, where the scenery changes around every curve, as you work your way deeper into the canyon. Along the way, you’ll pass waterfalls and scenic viewpoints, and near the end, you’ll find a peaceful meadow surrounded by cliffs. California Highway 180 runs east from Fresno into Kings Canyon National Park. Once inside the Grant Grove area of the park, continue on Highway 180. The road leaves the park and passes through Sequoia National Forest before reentering Kings Canyon National Park at the actual “canyon” portion of the park. The road passes Cedar Grove and ends at Kanawyers/Roads End. 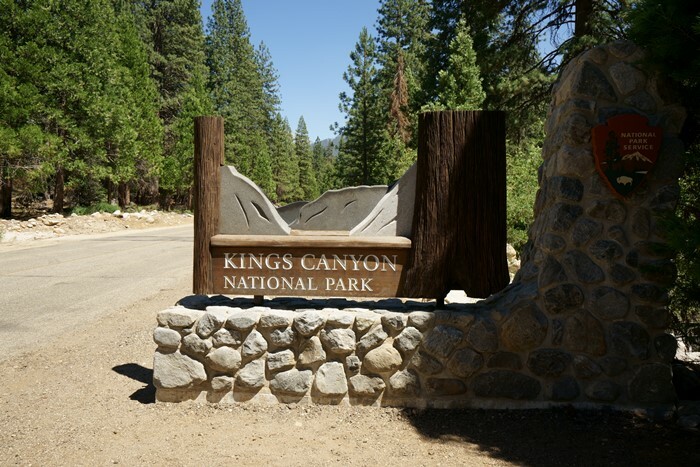 You can check Kings Canyon National Park off your list simply by visiting the Grant Grove area of the park. And if it’s winter or spring, you won’t be able to go any further. But the real heart of the park is deeper into the mountains. Once the snow has melted, you can drive Highway 180 all the way to its eastern end, deep in the actual “canyon” of Kings Canyon. There’s a turnout with a great view along the side of the road, just before you begin to drop down into the canyon. At the Junction View, the middle and south forks of the Kings River come together, after being separated by Wren Peak. 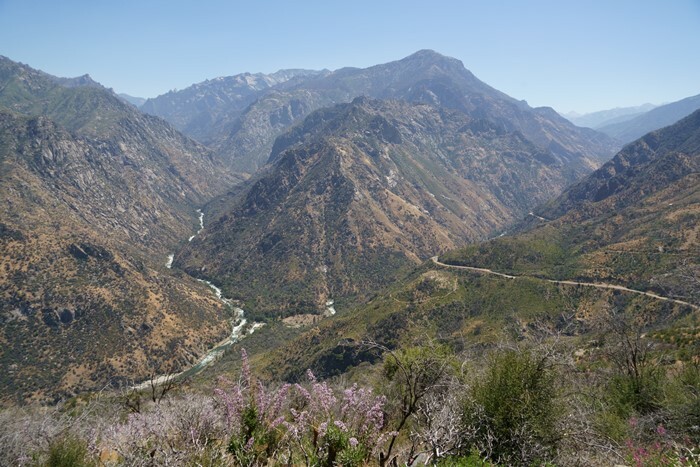 The scenic drive into Kings Canyon follows the south fork of the river, to the right. Headed downhill, you’ll pass this Instagram-worthy sign. 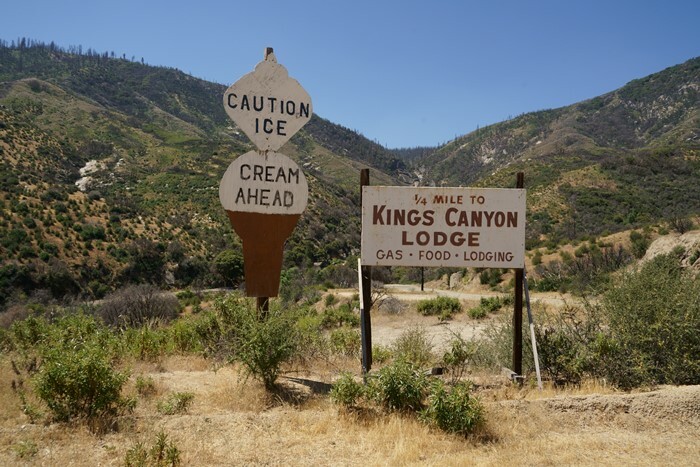 Sadly, there’s no ice cream ahead — the Kings Canyon Lodge, which was built in 1937, burned to the ground in 2015 during the “Rough Fire”. Three years later, I did see some signs of activity at the site, but no new building. 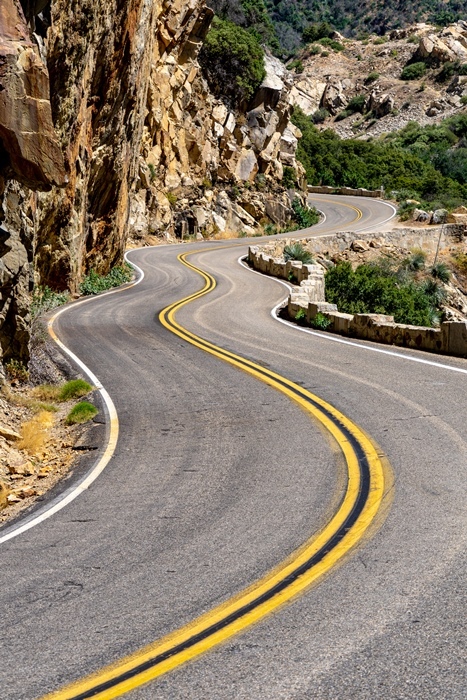 The scenic drive into Kings Canyon has some excellent curves as it makes its way along one cliff. With the river on one side and a mountain on the other, Highway 180 isn’t much more than a shelf on the side of the canyon. It seems like everyone stops at Grizzly Falls. This roadside attraction is outside of Kings Canyon National Park, in the Sequoia National Forest. Grizzly Creek plunges over this cliff before flowing under the road and into the river. During my visit, it was just a trickle compared to how it looks when it’s really flowing. Under these conditions, it was easy for people to climb around underneath and splash in the water. 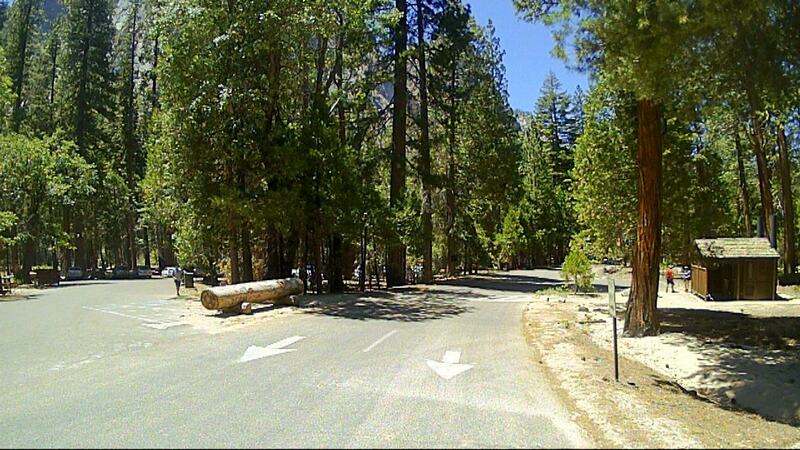 … and you’re back into Kings Canyon National Park. A turnout promises a view of the canyon, but you can’t see very much from here. As I explored, I began to realize that there really isn’t a great view of the canyon from the road. It seems like the road ends, just as the Kings Canyon is starting to get interesting. The most populated part of the canyon is at Cedar Grove. 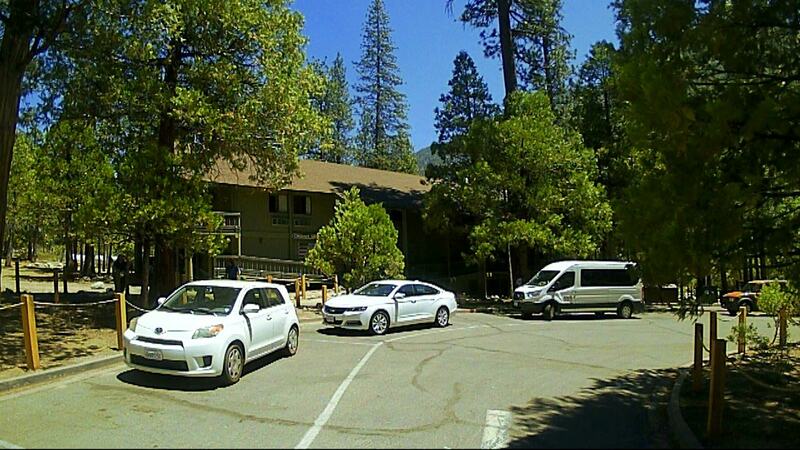 Here, you’ll find a small visitor center, a lodge, store, restaurant, and some campgrounds. A short, easy hike is required to reach the base of Roaring River Falls, on the south side of the highway. Climb around on the rocks and you can find some different viewpoints. Just be careful, the water is swift and the rocks can be slippery. Only the lower falls are visible from the end of the short trail. If you want to see more, you’ll have to scramble up the rocks. If you only have time make the scenic drive into Kings Canyon, hop out of your car at one spot, and then drive back, you’ll want Zumwalt Meadows to be that one spot. 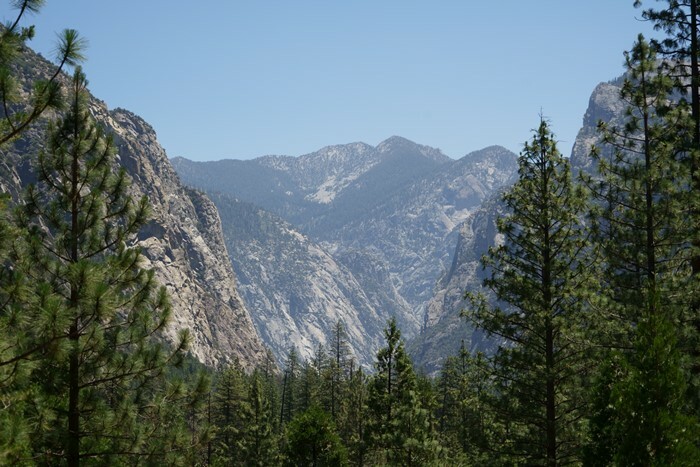 This popular 1.5-mile trail provides something that’s rare in Kings Canyon — unobstructed views of the surrounding cliffs. You can check out the entire hike around Zumwalt Meadows here. At the very end of Highway 180, the road forms a loop, and there are some parking spaces for the nearby trails. There are no short day-hikes here — although you could choose to hike just part of a trail and turn around. 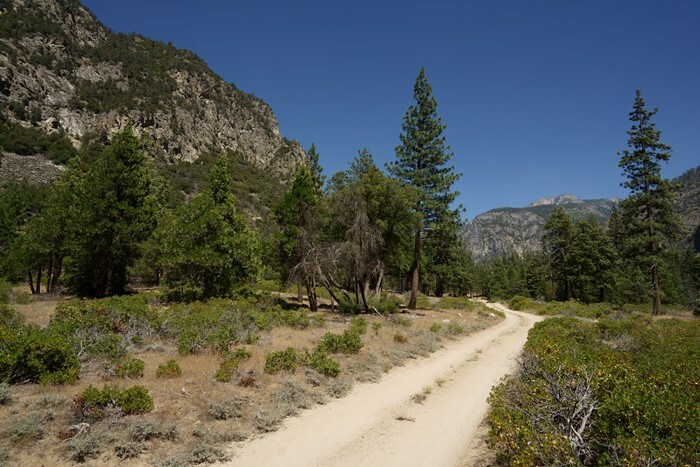 Bubbs Creek Trail begins here — it’s 12 miles from Roads End to the John Muir Trail. 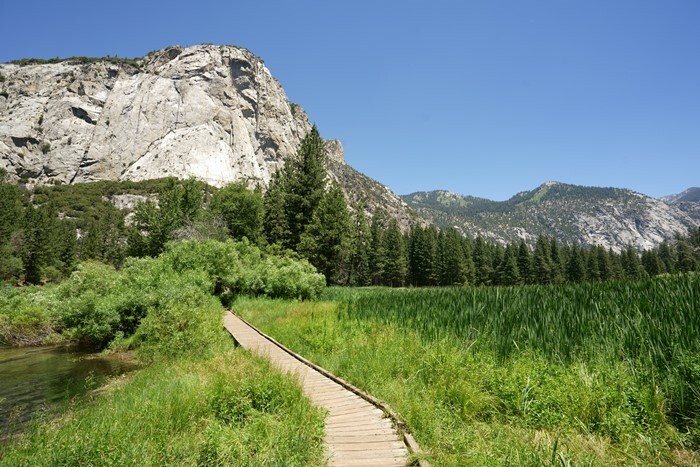 The Rae Lakes Loop is another option — it’s 41 miles long and requires reservations. Copper Creek Trail is the third option. It climbs steeply at the start, and throughout, gaining more than 5,000 feet over 8 miles (one way). If I had to choose one of these trails, I’d probably go with Copper Creek, because the switchbacks near the start of the trail probably provide some good views, rather quickly. On your way out of the canyon, you can try a short dirt-road adventure. The Motor Nature Trail is located on the opposite side of the Kings River from the highway. It’s a narrow, rough, one-way road that’s only open to westbound (outbound) traffic. Along the way, you’ll have access to the river, and you’ll pass through a few open spots, where you can take a few pictures. It’s not life-changing, but it is a fun alternative to the pavement. The dirt road ends near the Cedar Grove visitor center and lodge. 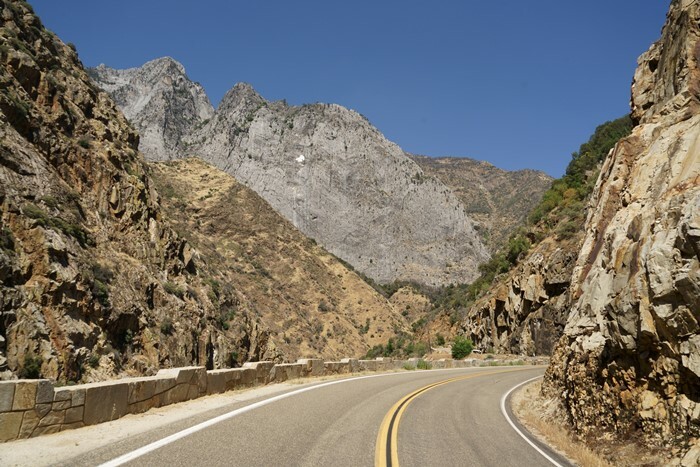 If the scenic drive into Kings Canyon is snow-free and open to traffic, I’d highly recommend you add it to your Kings Canyon National Park visit. If you don’t intend on hiking any long trails, you can probably enjoy this part of the park in a day, possibly with a few hours left over. 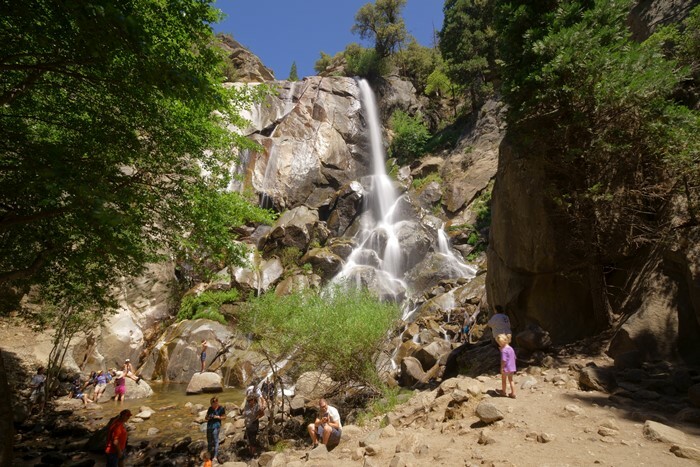 Be sure to enjoy the overlooks, the waterfalls, and take a hike around Zumwalt Meadows.